This Study represents a trend in anthropology to shift its attention to places of modern technology and bureaucracy. 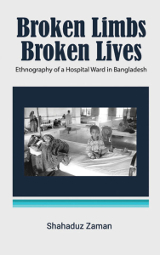 Shahaduz Zaman carried out anthropology fieldwork in an orthopaedic ward in a large government teaching hospital of Bangladesh. The study shows that in contrast to the assumed universalism in biomedicine, biomedical practice is in fact a product of particular social conditions. The Hospital reflects the features of its society. Behind the injuries and broken limbs in the ward are stories of violence, crime, and intolerance, occurring in a society where masses of people fight over limited resources. In the ward people interact in an extremely hierarchical manner. The patients, who are mainly from poor economic backgrounds, remain at the bottom of the hierarchy. Doctors and other staff members are often professionally frustrated. Strikes related to various professional demands made by hospital staff members, hamper the regular flow of work in the ward. Family members are engaged in nursing and provide various kinds of support to their hospitalised relatives. Patients give small bribes to the ward boys and cleaners to obtain their day-to-day necessities. Patients joke with each other and mock senior doctors. Thus neutralise their powerlessness and drive away the monotony of their stay. This shocking and humorous study shows how medical practice takes shape in an under-staffed, under-resourced and under-financed hospital of a low-income country, characterised by daily physical and structural violence.